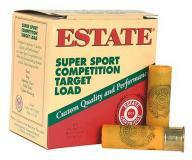 Super Sport Competition Target Load. Extra Hard lead shot for denser patterns. 2 1/2 Dram equivalent load. Uses: Clay targets, small game birds.